Username: This is the login name the member uses when she logs in to her account in your community. Name: This is the user’s real name, taken from her profile. If the user has not provided her name in her profile, this column is blank. E-mail: This is the email address the user entered when she registered on your site. Registered: This is the date when the user registered. Sites: If you enable sites within your WordPress Network, this lists any sites the user is a member of. Similarly to the Sites page, you can add and delete users to the network, as well as manage users by clicking either the Edit or Delete link that appears under their names when you hover over them with your mouse pointer (just as you do with sites on the Sites page). 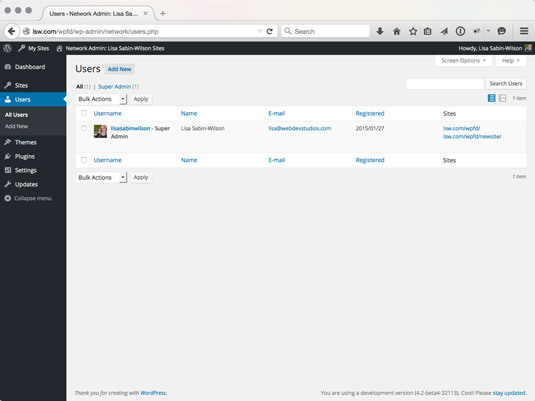 To delete a user, simply hover over the username in the list that appears on the Users page. Click the Delete link and a new screen appears with a page telling you to transfer this user’s posts and links to another user account (yours, most likely). Then click the Confirm Deletion button, and WordPress removes the user from the network, permanently. This action is irreversible, so be certain about your decision before you click that button! You can also edit a user’s profile information by clicking the Edit link that appears underneath his name when you hover your mouse pointer over it on the Users page. 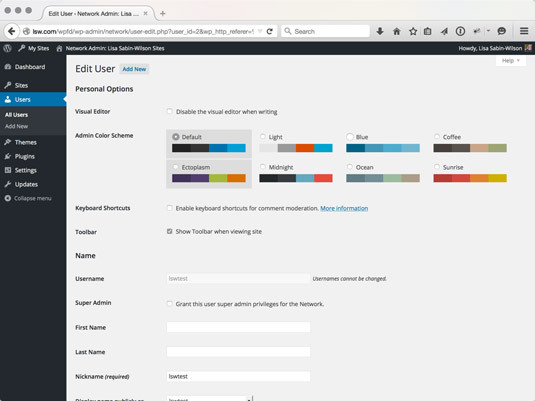 Clicking that link takes you to the Edit User profile page where you are presented with several options, which just happen to (mostly) be the very same options and settings that you configured for your own profile information. The Edit User profile page. The only difference with the Edit User profile page within the Network Admin Dashboard is one setting labeled Grant This User Super Admin Privileges for the Network. This setting is deselected by default; however, if you select this box, you grant this user Network Admin privileges for your network. Basically, this means that the user has the exact same access and permission as you do. Currently, the terms Super Admin and Network Admin are interchangeable. When WordPress first merged the WordPress MU code base with the regular WordPress software, the term used to describe the Network Admin was Super Admin. Right now, Network Admin is the standard term; however, the term Super Admin is still used within some areas of both the Network Admin and the regular Dashboard. That change will most likely occur in the very near future when the folks at WordPress realize the discrepancy and make the updates in later versions of the software. Also in the Users menu on the Network Admin Dashboard, you see a link called Add New; click that link to load the Add New User page on your Network Admin Dashboard. The Add New User page on the Network Admin Dashboard. You can add a new user from the Add New User page by filling in the Username and Email fields of the user you’d like to add and then clicking the Add User button. The new user is sent an email notification alerting her of the new account, along with the site URL, her username, and her password (randomly generated by WordPress at the time the user account is created).